Get the most out of your villa rental experience! Here are our updated step-by-step essential tips for renting a villa. 1. Before you depart call your cell phone company. A working cell phone is essential when renting an Italian villa. Check in with the owner or key holder as soon as you leave the airport to update them on your arrival time, or text throughout the week should a question or issue arise. Call your cell provider to ensure that your cell phone is unlocked and has the correct 900/1800 bands to be used internationally. You can then either sign up for an international call/date package, or rent or purchase an Italy SIM card. A personal WiFi hotspot, like the MiFi device, is the best way to avoid excess data charges and provides you with high speed Internet access anytime, anywhere. This means you can email, share photos, and Skype while you’re at your villa, or on a day trip. This portable device (about the size of an average cell phone) is rechargeable and allows you to connect up to 10 devices. The best part? Renting one is very easy. RentVillas will arrange for a device to be delivered to your home prior to departure, along with a postage-paid return envelope. Call us today to reserve 1-800-726-6702. Plan on using a GPS during your villa rental week! Plan on using one—a lot. Poor signage is common throughout the Italian countryside. Your rental voucher will include GPS coordinates for your villa. Rent a GPS unit with your rental car, or bring one from home with Italy maps loaded. GoogleMaps is also a good bet… but bear in mind data roaming charges. This is another great reason to rent a MiFi device! 3. Learn some basic Italian. Don’t worry! It’s not about proficiency. In reality, even a cordial “buon giorno” will earn you serious points. We recommend having a few key phrases under your belt to be called upon when shopping or dining. Americans are notorious for their lack of facility with foreign languages. Do what you can to change this perception! Stock your villa kitchen on arrival day. 4. Stock up on groceries and household supplies before you arrive at your villa on Saturday. Most stores are closed on Sunday. Plan on stopping in the town nearest to your villa and visiting a local market (COOP, Conad, or Eurospin to name a few). Buy enough food to last you through Monday. Request grocery pre-stocking so the initial shopping will be done for you. Contact RentVillas at 800-726-6702 for more details. If you’re traveling in the spring, summer, and early fall, be sure to purchase plug-in anti-mosquito devices (Vape is a popular brand) and/or coils. Mosquitos go hand-in-hand with countryside living! When you arrive at your villa, ask questions! The owner or manager is there to assist you. When you arrive at your villa, you’ll be greeted by the owner or a key holder who will provide an orientation. Take the time to ask for instructions on operating appliances such as European-style dishwashers, washing machines, and stoves, as well as steps to take in the event of a power outage. Hot Tip: Google Translate is a great tool for overcoming the language barrier. Don’t rely on written instructions! Cover all the bases, including utilities, such as heating (available November 1st – April 1st) and/or air conditioning. 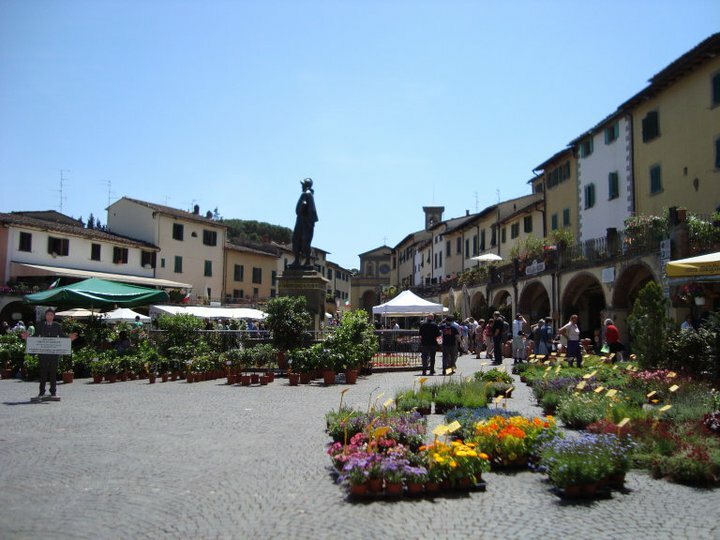 Shop at an open air market during your Italian villa rental experience. 6. Shop at the weekly markets. 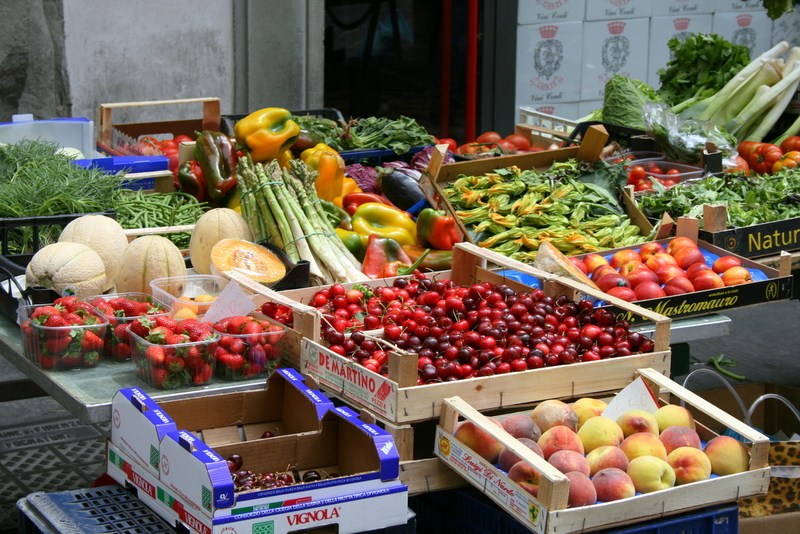 Every town and village in Italy has a weekly open air market. Here you’ll find fresh, seasonal produce, cheese, bread, salumi, housewares, and clothing, to list only a handful of available items. The markets offer the perfect way to learn about local cuisine. Keep an eye on where the natives shop—they’ll guide you to the best vendors. You’ll find a bounty of fresh, seasonal produce at weekly markets. 7. Attend local cultural events. If see a sign for an event in your local village, do yourself a favor and check it out! Concerts, theater, and seasonal gastronomic and religious festivals are a fantastic way to get to know the culture of the region. 8. Allow time to simply enjoy your villa or apartment. The secret to a great trip? It can be tempting to plan to spend every last minute day-tripping and seeing the sights. Consider carving out a day (or more) to simply enjoy your home-away-from-home with family and friends. Take time to savor the villa experience! 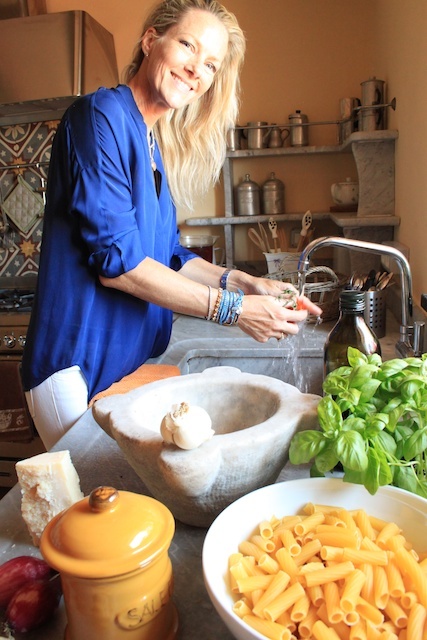 Learn to Cook… in Rome! 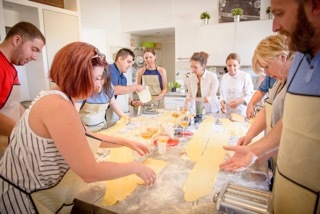 Learn to prepare traditional Roman cuisine in the heart of Rome! Dolce Vita Cooking Class – – New for 2017! 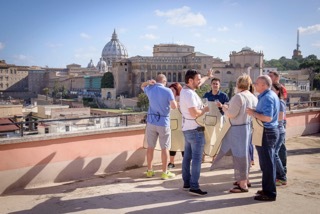 Enjoy an incredible view of the Vatican during your cooking school experience in Rome! 4:00 PM – Your culinary experience begins! Meet your instructor, Giorgia, at street level. She’ll introduce you to the area and the building where the class is held. Once upstairs, you’ll meet Chef Monia, who will provide an overview of the afternoon’s class and what you can expect. Wine and mimosas are served on the terrace, which offers an incredible view of the city and the Vatican. The class begins with the preparation of bread and tiramisù. If kids are participating, you’ll also learn how to make pizza dough. Breads include types made with tomatoes, onions, and olives. Next, it’s time to prepare the dough for ravioli and fettuccine–followed by a break for another glass of wine and an antipasto. Cooking is hard work! Now it’s time to enjoy the fruits of your labor: Dinner. The meal includes an antipasto and two first courses. Bread, sodas, orange juice, water, wine, coffee and limoncello are all included int the price. Cost per person: 125 Euros for 3.5 hours. Larger groups can be accommodated; please inquire for special rates! Beverages and a complimentary antipasto are included. 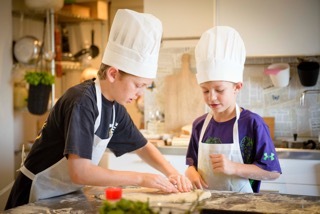 Kids cook, too, at our Dolce Vita cooking class! Overview: Departing from Naples, Rome, or any location on the Amalfi Coast, this 8-hour, all-day driving tour offers a fantastic introduction to the Amalfi Coast. Your knowledgeable driver/guide will show you the unparalleled natural beauty of this region while you relax in the air-conditioned comfort of a private van. No need to worry about the notoriously narrow roads or the lack of parking! You’re in excellent hands. Your day begins in Positano, a lovely fishing village where homes appear to tumble down to the sea. Next, you’re on to Sorrento, where once again you’ll experience spectacular vistas and gorgeous coastline. After exploring the charming shops, you’ll continue on to Amalfi. Here you’ll enjoy free time for a leisurely stroll, as well as a visit to the 9th century cathedral. The tour culminates with a visit to Ravello, a medieval town perched high above the sea. Lunch will be enjoyed in Ravello at a distinctive local restaurant. Your return trip includes additional sightseeing. Cost: 660 Euros for 1-7 pax. Note: Departures from Rome are not included in the price. Lunch is an additional cost. Visit the ruins of Pompeii! Overview: This tour offers a fascinating glimpse of Naples, Italy’s third largest city and for many centuries, the capital of the Italian state. The second part of the tour includes a visit, on foot, to Pompeii, one of the most interesting archaeological sites in the world. Next stop is Pompeii, the city that was buried in ash spewed fort in the 79 AD eruption of Mount Vesuvius. Lunch will be enjoyed in Naples at a distinctive local restaurant. Cost: 674.00 for 1-7 pax. Larger groups can also be accommodated; please inquire for rates! Note: Departures from Rome are not included in the price. Lunch is an additional cost. Museum/site entrance fees are not included. Please note: Your driver/guide will offer a basic overview of Pompeii. For an additional in-depth explanation of we recommend the services of a licensed archaeological guide. Licensed guides are available for a minimum of 2 hours, for an additional cost of 140 Euros. Enjoy Capri’s breathtaking views of the Tyrrhenian Sea. Overview: This is a 6-hour driving tour (in a convertible!) around one of the loveliest and prestigious destinations in the Tyrrhenian Sea. Get to know the entire island from the comfort of a private car. Your tour begins on the island, so we recommend taking the ferry from Naples, Sorrento, or another location on the Amalfi Coast. Your English-speaking guide will meet you at Marina Grande, Capri’s main port. The first stop on your driving tour will be Anacapri, an ideal spot to enjoy not only the lush and beautiful landscape, but some of the island’s best food, as well. From Anacapri, you’ll summit Monte Salaro, Capri’s highest point. There, you’ll gaze down upon sweeping views of the Tyrrhenian sea and the Bay of Naples. Your next stop is the Blue Grotto. Here you’ll have the opportunity to explore the magically illuminated cave; your guide will take you directly to the cave’s entrance, where you’ll then proceed via rowboat. Enjoy a delicious lunch in a seaside restaurant with incomparable views. After lunch, travel by convertible to Capri’s famous Piazetta, a charming shopping area with wonderful outdoor cafes. Cost: 495 for 1-7 pax. Larger groups can also be accommodated; please inquire for rates! Note: Lunch is an additional cost. Museum/site entrance fees are not included. Enjoying la dolce vita on the piazza in Amalfi. If you’re a wine aficionado or just want to learn more about the world of Tuscan wine, we recommend booking a wine tour during your villa rental week! The wines of Tuscany are some of the greatest in the world! Get to know them with an expert. Overview: Explore the Chianti countryside then enjoy tastings, a cellar visit, and lunch at a Chianti wine estate. This full-day tour begins when your guide picks you up in Florence (or at your villa for an extra cost) to travel the picturesque Chiantigiana road, winding through vineyards, olive groves and towns. You’ll stop first to tour Montefioralle Castle, then on to Greve, the pretty market town which is the capital of the Chianti region. The special treat comes when you visit the working winery of Fattoria Montagliari, where you’ll see the cellar and taste the Chianti Classico made by the welcoming family; a lunch at the winery (menu changes daily) is available for an extra cost (paid locally) of 25 Euros per person. Afterward, you’ll drive through Panzano and on to Castellina, a pretty medieval town. The tour does not include wine tastings & snacks, meals, museum entrance fees, or gratuities. The order of the tour stops may change depending on local conditions. The cost for tastings and snacks will be paid directly to the wineries. Cost: 450 Euros (1-4 pax); 500 Euros (1-8 pax). Larger groups can also be accommodated; please inquire for rates! We had a very enjoyable day tasting Chianti wines and olive oil in Tuscany. Our first visit was hosted by the owner who shared his knowledge and passion in his vineyards. He took care to show us the differences in cultivating merlot, syrah, and Sangiovese vines. Learning to tell the difference by color and shape of the leaves was fascinating. He was a great tasting host, showing us the photo of the pig that was “contributing” the salami and giving us tastes of all of his wonderful wines. A highlight for our younger kids was the chocolate in olive oil (to be believed!). Our group is returning to the U.S. with many samples of wine and olive oil. Our second stop was at a much larger winery. We got to see more varied production techniques at a larger scale than the first stop. Our tasting was actually a delicious luncheon – four courses, each with an appropriate accompanying wine. We couldn’t resist taking a few samples with us. Full but not deterred we were delighted to see the next stop was another smaller producer. This one was known for being the first to grow Merlot in Tuscany – near heresy at the time. Our hostess was delightful and shared stories and history of the winery and the region. Again, the wine was wonderful and, of course, we purchased some samples to share back “home”. Thanks, Jonathan, for your careful driving and Maurizio for the comfortable car/mini-bus and arranging the tour. Enjoy a taste of Tuscany! 2. Taste of Tuscany Wine Tour – NEW for 2017! 9:00 AM: Your guide will pick you up at your villa. 9:30 AM: Visit Greve-in-Chianti. Your tour will begin in the main piazza–where you’ll pop into Falorni, the oldest butcher shop in Italy. 10:00 AM: First tasting! Enjoy a tour and tastings at Castello di Verrazzano (90 minutes). Tasting cost: 18 Euros/person. 2:15 PM: Lunch at Altiero winery in Montefioralle (2 hours). Cost: 25 Euros/person. 3:15 PM: Tasting at the winery of your choice in San Gimignano (30 minutes). Cost: 10 Euros/person. 5:30 PM: Return to your villa for R&R. Cost: 562.50 Euros (1-8 pax). Please see above for individual tasting costs; all amounts are payable directly to the wineries. Gratuity is not included. Larger groups can also be accommodated; please inquire for rates! The beautiful village of Montefioralle–your second stop on the Heart of Chianti Gastro Tour! 3. Heart of Chianti Gastro Tour – NEW for 2017! Overview: Following a breathtaking drive through the countryside, you’ll end up at its very heart: Greve. Start the day by sampling aged ham and pecorino… then you’re off to Grevepesa winery in nearby Montefioralle for tastings, a guided tour, and delicious lunch with pairings. Your guide will pick you up in the morning from your villa – transportation is included! Travel to Greve, where you’ll convene in the charming main piazza under the statue of Giovanni di Verrazzano, a famous navigator and the town’s most famous citizen. Lined with shops, cafes, and restaurants, the piazza is also home to the Falorni butcher shop–renowned for its house made prosciutto and pecorino. You’ll sample the shop’s specialities, and then it’s off to hilltop Montefioralle (4 km). At noon your visit to the cellars at the Grevespa winery begins. Your guide will show you the modern facilities for pressing, fermentation, and storage of wine. In addition, you’ll see the old cellars with historic casks and small barrels for vin santo. The bottling plant, with its exciting and noisy operation, is your next stop. Lunch is served in the on site restaurant. Chef Daniela will prepare affettati toscana (local salumi), various bruschetta, and pecorino to start, followed by two different pastas. Conclude the meal with cantuccini di prato (traditional biscotti) along with vin santo and two more Grevespa wines. Cost: 120 Euros/person. 1-8 pax. Transportation from/to your villa, tastings, and lunch are all included in the price. Larger groups can also be accommodated; please inquire for rates! Please contact RentVillas at (800) 726-6702. To confirm a reservation, a 20% non-refundable deposit is required. Upon receipt of the deposit, you will be put in direct contact with the tour purveyor who will answer your specific questions regarding the details of the experience, including balance payment, extra costs, and the meeting time. We recommend that reservations be made at least two months prior to your departure. Rent a villa in Positano! There are regional celebrations throughout the year, so be sure to find out in advance what local events are happening during your visit. The Wagner Music Festival runs from June to Septem­ber in Ravello at Villa Rufolo, featuring symphonies, chamber concerts, operas, ballets, and plays. On the first Sunday in June, Amalfi celebrates its history as one of the four Ancient Maritime Republic cities (including Genova, Pisa, and Venice) with a historic regatta; every four years the event is held in Amalfi. Galleons sail on the water crewed by locals in period costume. Sant’Andrea, Amalfi’s patron saint, is celebrated both on his birthday (November 30) and on the day a miracle saved the city from pirates (June 27). A statue of the saint is carried in procession, accompa­nied by fireworks, music, and food. On July 27th, Ravello takes their turn celebrating in honor of their patron saint, San Pantaleone, with a beautiful procession following by fireworks after dark. The view overlooking the coastline is not to be missed! The slopes of Mount Vesuvius (near Naples) are some of the oldest wine-producing areas in Italy. 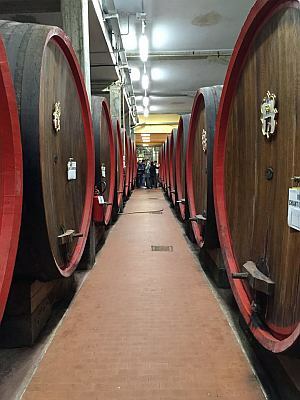 The most famous wine is Lachryma Christi – literally, “Tears of Christ.” Other regional wines include Taurasi, a full-bodied red from Avellino, and Fiano d’Avellino, one of the best whites in Italy. Accessible only by boat, the Grotto dello Smeraldo is breathtaking in its beauty. Once a dry-land cave, changes in the landscape allowed the brilliant blue-green water inside. Now glistening stalagmites jut out of the water; overhead, light dances over stalactites. The grotto is located in Conca dei Marini, about five kilometers west of Amalfi. Amalfi Coast cuisine is seafood-based, incorporating locally grown produce such as tomatoes, lemons, and red peppers. Insalata caprese is a simple salad composed of sliced toma­toes, fresh mozzarella, basil, and olive oil. The coast’s other specialty is limoncello, a delicate, lemon-infused digestivo served ice cold. The Circumvesuviana rail line skirts the base of Mount Vesuvius, connecting Naples and Sor­rento. Midway along the route, the Pompeii Scavi stop is just a few minutes on foot from the ruins. 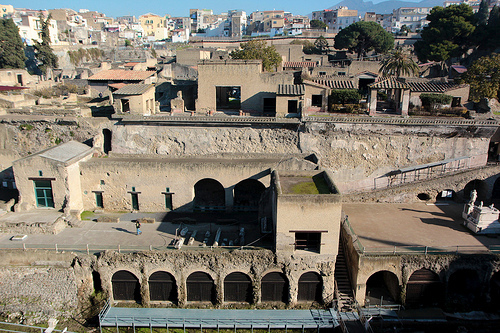 Tickets to the ruins at Pompeii now include entrance to Herculaneum, a sister city also destroyed by the volcanic eruption. 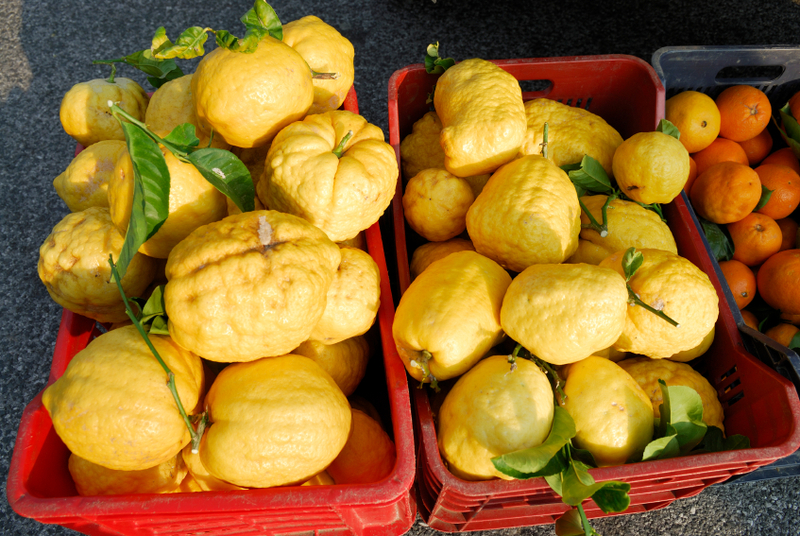 The Amalfi Coast is known for its citrus, which figures prominently in local cuisine. Perched on precarious vertical slopes, everything on the Amalfi Coast is either up or down, so almost all visitors will get a workout! Serious hikers, however, may want to try some of the stupendous mountain trails. Tracing the crest of the coastline, the Sentiero degli Dei (Path of the Gods) is one of the most grueling – but everyone who tackles it swears the views are worth every step. Antica Rocca (sleeps 10) is located in a medieval hamlet. This week I’ve got more to share about the area called the Alta Tuscia—situated on the borders of Lazio, Tuscany, and Umbria. In my opinion, this area really offers the best of all three regions. Although located at a cultural crossroads, it has somehow remained unspoiled, with authentic towns, un-inflated prices, rural peace and quiet, and abundant traffic-free hiking, road and mountain biking opportunities in striking natural surroundings. La Cappella dell’Alfina is a charming farmhouse near Acquapendente. I visited two exceptional properties near Torre Alfina (our home base for the week), La Cappella dell’Alfina and Antica Rocca, and did some additional exploring throughout the area. Here are the highlights! Perugia is about 1 ½ hours away, and is worth the trip. With a rainstorm brewing we had lunch on the piazza facing the Duomo and the Fontana Maggiore. Carpaccio with arugula and Parmigiano-Reggiano has never tasted so good! Civita’ di Bagnoregio is a tiny, Etruscan village perched atop a plateau of volcanic tuff. It’s right out of a fairy tale! The village was made famous, quite literally, by Rick Steves! He put it on the map (and has done the same thing with the Cinque Terre) and thereby has helped to save it from disintegration. His photo is everywhere in town! We walked against howling wind along the pedestrian bridge that leads into town and wandered around the hamlet and found a great trattoria. It was a fun adventure! 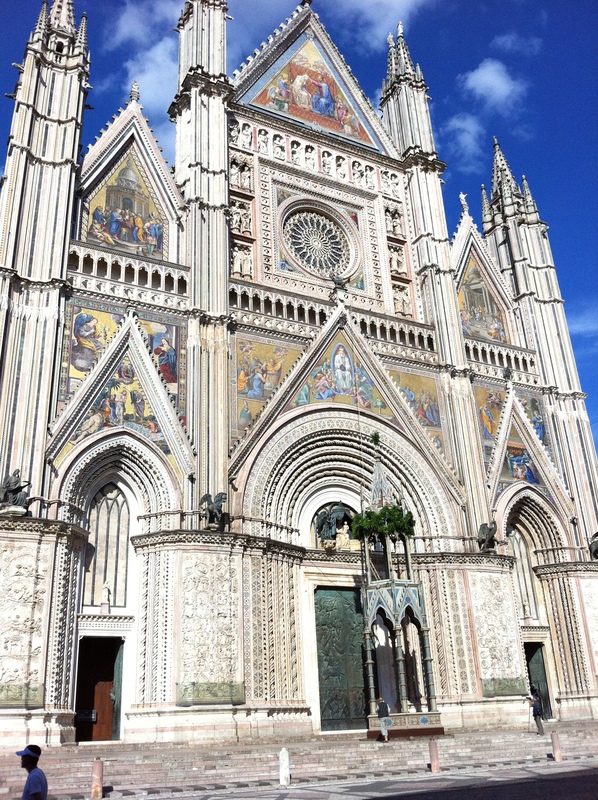 The spectacular duomo in Orvieto. Orvieto is only 20 minutes away from Torre Alfina and Villa del Castello. We headed there for a stroll, a little shopping, and to gaze at the extraordinary Duomo. We were thrilled to find the town almost empty. What a treat to have it to ourselves! Todi is also wonderful for a passegiata. For a full day trip, I highly recommend Pienza and Montepulciano. Pienza is known for its pecorino, and Montepulciano has outstanding shopping. It’s also fun to do a wine tasting at the Col D’Orcia estate in Montalcino (book in advance), and then stop in either San Filippo Terme or Bagno Vignoni to soak in the thermal baths (just remember to bring swimsuits!). I’d also encourage you to see the “tufo towns” of Sorano, Pitigliano, and Sovana—three towns in the Maremma (southwestern coastal area of Tuscany) carved into or built out of volcanic rock (tufo). If you leave early enough in the morning, it is possible to do all three. But if not, don’t miss Sorano. It’s a gorgeous little artists’ village in an area known for its “fjords”. If you are in Sovana at lunch time, stop at Taverna Etrusca for a light lunch. 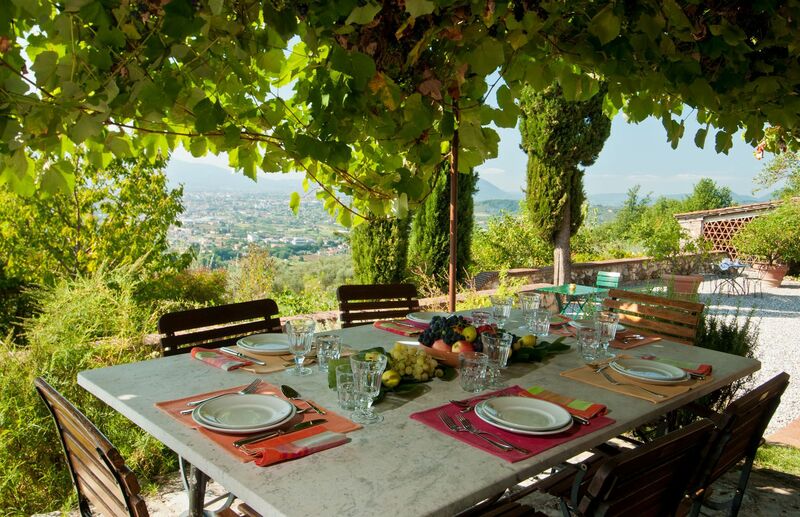 Villa del Castello (sleeps 6) is located on the border of Tuscany, Umbria, and Lazio. If you’re looking for an authentic Italian village experience, Villa del Castello is your property! It’s located in the center of the medieval village of Torre Alfina, a rustic, rural spot populated by locals—not tourists. We also have three other villas in this area, each wonderful and unique and close by: La Cappella dell’Alfina, Antica Rocca, and Casale Giardino (more on these villas, as well as the region in general, in next week’s newsletter! Stay tuned!) Honestly, I almost hesitate to say too much about the area and the villas—lest it become a tourist destination! I can’t emphasize enough how peaceful and crowd-free it is relative to Tuscany. A perfect spot for al fresco meals at Villa del Castello! Villa del Castello is more spectacular than the photos! The garden area is large and impeccably groomed. The furnishings are Old World and high quality. We felt as though we had stepped into a gracious, well-appointed home. There is good WiFi (in the dining room), adaptor plugs (and a power strip to accommodate all of our chargers! ), a Tom Tom to borrow, two cell phones, and even a vegetable garden and chickens (guests are welcome to the bounty!) A few steps away there is a hotel with pool (open to guests of the villa) and restaurant. The village, which includes a world-class gelateria, is also close by. The caretakers live nearby and are always available. Villa del Castello has an amazing view of the castle! This part of Italy is an ideal destination for people who love the outdoors. There is an extensive trail network (for both hiking and mountain biking), as well as lakes (Bolsena and Bracciano). The owner of La Cappella dell’Alfina took us on a hike in a prehistoric volcanic forest which was only about 1-2 km away from our villa, just below the Castello di Torre Alfina. The forest was an otherworldly place, with many varieties of old-growth trees and lichen-covered volcanic boulders. We were shown caves in the forest where the villagers hid during the Nazi occupation. This part of Italy is an ideal destination for people who love the outdoors. The Via Francigena is one of Europe’s principal pilgrimage routes (like the Camino de Santiago in Spain) and was established in 990 for pilgrims en route to Rome. It passes through the countryside near Torre Alfina, also called the Alta Tuscia. Locally, the trail criss-crosses the Via Cassia (the ancient road to Rome) gravel paths and rural roads. A number of the trail’s most scenic legs start within a short drive of the villa. Lago di Bolsena is a beautiful volcanic lake that was formed by an eruption that occurred hundreds of thousands of years ago. All around the lake there are beaches, swimming holes, picnic grounds, and restaurants—not to mention clean, clear water! There are two islands in the middle of the lake, both with monasteries on them. In the summer there are regular boat cruises from Bolsena and Capodimonte. We hiked a beautiful trail, the historic Sentiero dei Briganti, which encompasses 100 km of trails along the Tuscany/Lazio border that were originally used as escape routes by local brigands. The trail is ideal for mountain biking, horseback riding, or hiking. Incidentally, Leg 37 of the Via Francigena, which originates in San Lorenzo Nuovo, follows the lakeshore to the beautiful town of Bolsena on a segment of the Sentiero dei Briganti. La Solaia (sleeps 6) is located near Certaldo, south of Florence. The Firenze Card offers a great way to visit the city’s museums–and avoid the lines! One week before we left, we purchased our Firenze Cards online. The cards are 72 Euros each and are good for a period of 72 hours. With the card, we gained free access to most of the museums in the city, were guaranteed a spot at the front of the line, and received free passes for public transportation. This really makes a difference for places like the Accademia and the Uffizi! There is a Firenze Card office (one of many located throughout the city) across the street from the train station. We popped in as soon as we got into town on the train from Certaldo, and within minutes were equipped with our cards, maps, and WiFi information. On our first day with the cards, we headed straight to the Accademia Gallery (home of Michelangelo’s David), and then to the Ferragamo Museum. Afterwards, we took a Viator walking tour of the Uffizi and the Vasari Corridor. It was EXCELLENT! Our guide was engaging, personable, and educated. It was impossible to let your mind drift, since he immediately learned everyone’s name, and would call upon each of us individually! The tour took 3 hours. Highly recommend! On day two, we went to the Palazzo Davanzati, a palazzo that has been under restoration for the past several years. I can’t tell you the number of times I’ve tried unsuccessfully to enter this building! If you love peeking into the lives of people who lived in the 14th to 16th centuries, this 4-story palazzo is a must. Bear in mind that it has restricted hours (10:00 AM – 1:30 PM), and that in order to visit the two top floors, you must ask the custodian on the first floor to be placed on the list. The access is only available at 10:00am, 11:00am and noon. I highly recommend doing this! Next we were on to the Museo Galileo, the Bargello Museum, Gucci Museo, and the Jewish Synagogue and Museum (a little out of the way, but worthwhile). On the 2nd day of our stay at La Solaia we drove to Bargino to visit the newly opened Antinori Winery, begun in 2005 and finished just this past March. It was quite a WOW experience! We made reservations online; click on “Book a Visit”. The visit costs 20 Euros per person for an hour-long tour and tasting of 3 wines. The building’s design and architecture are out-of-this-world! After the cellar tour and tasting, we had a memorable lunch in the restaurant. Makes for a perfect day trip! The kitchen at La Solaia is well-equipped for cooking and entertaining during your villa rental experience! La Solaia is truly lovely. It was constructed out of an old wine cantina that was used before WWII by the family. We love that the villa is all on one floor (so unusual for Italy) and the open-plan design that encompasses the living room, dining room and kitchen. There is wonderful art on the walls as well as comfortable, tasteful décor. The owner, Elizabeth, is an American married to an Italian. As is the case with all her villas (Villa Certaldo and Villa Sella—also on the same estate) La Solaia is fully-equipped with every possible amenity and comfort. There’s a big PAM supermarket just 10 minutes away. The shared pool (16 m) is great for swimming and is the ultimate jet lag cure! This place is perfect for a large family/families or group of couples, since the three villas (soon to be 4, when the house below La Solaia is furnished) are far enough away from each other for privacy, but close enough for visiting back and forth. They all share the same parking area. We drove into Certaldo and took the funicular up to Certaldo Alto, the medieval historic center. It’s a great spot of a gelato and a stroll. I had the best limone gelato of my life—and I’ve tried it everywhere! Getting into Florence from La Solaia was a snap. We drove the 10 minutes from the villa to the Certaldo train station and parked our car in the lot right next to the station. A quick ticket validation (we’d purchased tickets the night before at the automated machine, but this is not really necessary, as it is easy to do right before catching the train), and we were ready for the train, which runs, in general, about once an hour at 10 minutes after the hour, and takes 45 – 52 minutes. During “rush hours” there are more trains. The train is Siena – Florence; Florence – Siena. Three chefs came to La Solaia to prepare dinners. All of them can accommodate food allergies and preferences. They can also provide in-home cooking classes. Elisa Porciati has been a chef for 12 years, running a tavola calda with her mother, and working as a private villa chef for 4 years. She prepared an amazing, beautifully presented dinner, including eggplant timbale (my favorite! ); saffron risotto with vegetables; roasted rabbit with a tomato, bread and herb gratin; and finally a pudding with herb-roasted peaches. Mattisse, a veteran chef and longtime RentVillas partner, prepared a beautiful meal of bruschetta with sautéed mushrooms; a risotto with fish, parsley, and onion; flambéed chicken breasts with lots of herbs, served with grilled zucchini; and panna cotta. Wonderful! Mattisse has developed several types of new menus, including organic, health-wise options.